WASHINGTON — Phase Four, a startup developing electric propulsion systems for small satellites, has won its first major orders for those thrusters from two companies. Phase Four announced Jan. 31 that it sold six of its Maxwell electric propulsion systems to Capella Space, a company developing a constellation of radar imaging satellites, with an option for an additional, undisclosed number of thrusters. The company separately announced a deal with Tyvak Nano-Satellite Systems, a smallsat manufacturer, for “multiple” Maxwell thrusters. 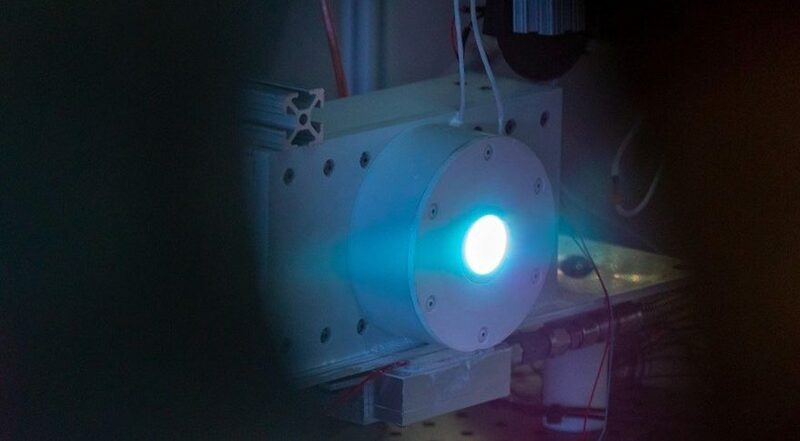 Maxwell is the first electric thruster system offered by Phase Four, which has been developing systems that use radiofrequency technologies, rather than electrodes, for generating plasma. The company argues that approach is less expensive and easier to manufacture that alternative thrusters. While the company announced last year smaller deals for thrusters with NASA and Earth imaging company Astro Digital, Phase Four considers these deals to be the first major order for their thrusters. “We have a relatively high quantity order from multiple customers, which for us represents the commercial traction that we have been seeking, and it validates where the technology sits in the ecosystem,” Beau Jarvis, chief executive of Phase Four, said in an interview. Phase Four is one of a number of companies developing propulsion systems such as electric thrusters for small satellites, seeking to tap the growing interest in such spacecraft. The company argues that its thrusters offer performance that matches legacy systems but at lower prices. That was cited by one of the Phase Four’s new customers as the reason for buying Maxwell thrusters. “Selecting Phase Four’s Maxwell as an engine for our satellites enables higher performance at lower cost,” said Christian Lenz, vice president of engineering at Capella Space, in a statement. Those thrusters will be incorporated into satellites the company plans to launch later this year. Phase Four has tested its thrusters with other gases, including argon and nitrogen. Those gases offer lower performance compared to xenon but are less expensive. “It’s one of those trades that spacecraft manufacturers will have to look at,” he said. The company sees its future demand for Maxwell thrusters coming from companies developing microsatellite-class smallsats, rather than smaller cubesats. Jarvis said planned constellations of such satellites for broadband communications and Earth observation should create high demand for propulsion systems like Maxwell in the next few years. Phase Four has emphasized that it can address that market with high production rates. The company is currently able to produce up to 10 Maxwell thrusters a month, and expects to double that production rate by the end of the year using its existing facilities. Jarvis said the company started planning for higher production rates by hiring last fall a new director of supply chain and materials, Laura Overly. “Anytime you’re building anything at a quantity above one, you have to start thinking about supply chain implications six months down the road,” he said. That higher production rate should be sufficient through 2020. After that, he said, the company will consider moving to a larger facility if demand grows for its thrusters or work with smallsat manufacturers to set up production lines in their facilities. Phase Four has also started working to raise a Series A funding round, Jarvis said. That funding, he said, will likely come from a mix of new partners and those who invested in the company’s seed round. He declined to disclose the size of the round, but said it would be sufficient to fund the company through 2020.